Expressing grave concerns on the soaring incidents of kidnappings for ransom and demands for extortion, the Founder and Leader of the MQM Mr Altaf Hussain has asked the established to find out the elements within its ranks who were harbouring criminals involved in these heinous offences. He urged upon the business community to pluck up courage and tell the public about the criminal elements involved in kidnappings and sending extortion slips and the people who support them. He said this while talking to the MQM office-bearers, workers and volunteers at the main camp set up for collecting hides of the sacrificial animals under the Khidmat-e-Khalq Foundation. He complimented Muslims throughout the world on the occasion of Eidul Azha and said that this festival reminds us about the Sunnah of Prophet Hazrat Ibrahim (AS). He said that the Muslims observing the Sunnah of Hazrat Ibrahim (AS) also resolve that they would not hesitate from offering any sacrifices in the way of Allah. Mr Hussain said that Eid is the festival of joy and happiness, but the workers of the MQM had been sacrificing their happiness for the last 35 years by following the Sunnah of Hazrat Ibrahim (AS) and making a practical demonstration of self-sacrifices. 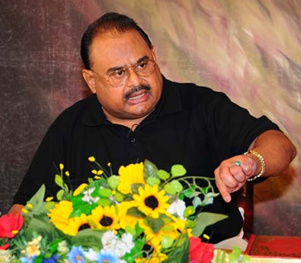 He said that the MQM workers and office-bearers always served the people in difficult times. Whether it was devastation caused by heavy floods or catastrophic earthquake or any other disaster, the MQM workers give up their rest, food and comfort for bringing help to the needy people. He said that the MQM is the only political party in the country whose office-bearers work alongside common workers instead of enjoying the ease and comforts of their homes. If someone wanted to see a practical demonstration of equality as told by the Holy Prophet Hazrat Muhammad (PBUH) on his last sermon, he can see it in the MQM. Shedding light on the spirit of selflessness and sacrifice, Mr Hussain said that no power in the world except Allah Almighty can wipe out the nation whose people had the inspiration to offer sacrifice. He praised MQM workers belonging to different zones, sectors and units for sacrificing their Eid happiness in order serve the needy people. Mr Hussain said that the MQM wants to serve the people without fearing about the consequences. The MQM believes in serving the people irrespective of the prejudices of caste, colour, race, ethnicity, religious beliefs and sects. Mr Hussain said that the MQM believes in promoting religious and sectarian harmony, showing tolerance towards each other and establishing a universal harmony among different religions. He said that certain elements were trying to sabotage the efforts of the MQM in order to ruin peace ofKarachi. Mr Hussain said that it was the responsibility of the establishment to find out the elements in its ranks who were supporting and protecting the criminals involved in kidnappings for ransom and extortion inKarachi. He said that the business community should also show courage and disclose the elements that were involved in kidnappings and extortion inKarachialong with their supporters. In the end, he gave Eid greetings to the MQM workers, supporters, intellectuals, columnists, journalists, anchor persons, cameramen, press photographers and other people of the print and electronic media and expressed best wishes for them.